There is no doubt that awnings are one of the most popular shade products on the market, not just in Australia, but in any country that experiences hot climates throughout the year. Therefore, it is no surprise that you have stumbled upon this page in the search for awnings in Sydney. But, before you start your search, it’s important that you know what you need to look for, otherwise you may end up with an inferior product that won’t offer the protection you need. I have met many customers that turned to Global Shade after having purchased inferior grade awnings from other suppliers – consequently their awnings needed to be replaced in no time at all. In order to avoid this, finding quality awnings in Sydney is a must. The most important thing to consider when doing so is to deal with a reputable supplier. Choosing the right company will mean that you will receive long term service and easy installation of your awnings. Being in the shade industry for over 25 years, and being an awnings manufacturer and supplier myself, I certainly know what it takes to select superior awnings, which outlast other products in the market. Continue reading this article as I outline the necessary steps you need to take in order to find top quality awnings in Sydney. First, you need to ask your supplier about the quality of awnings they offer in Sydney. Good quality awnings can last more than 25 years, while poor quality awnings will only last about 5 years. Quality can be determined by taking a look at the materials used in the awnings. For fabrics, you should opt for man-made breathable fabrics, which last up to six times longer than natural fabrics and for frames, you should choose aluminium frames rather than steel. Also, many awnings come with endorsements and engineering certifications so you should always choose products that have been certified and approved to offer UV protection. At Global Shade, we offer high quality man-made fabric awnings in Sydney, supported by stylish and lightweight aluminium frames, which are up to 320 GSM and offer 99% UV protection. Next, you need to enquire if the supplier offers service guarantees. Even for budget model awnings, your supplier should offer you a minimum guarantee of 6 years on frames and fabrics. Reputable Sydney awning companies back their merchandise with installation support, service guarantees and warranties on products. All products offered by us at Global Shade are backed by technical and trade expertise, superior customer service and installation and after sales service and support. Finally, you should always look to choose a supplier who can offer you custom awnings tailored to meet your needs. Whether you’re looking for an awning for your Sydney home, office or commercial space, you need to ensure that it is customised to suit the exterior of your building and that the design and style blends well with other structures. Here, at Global Shade, we offer stylish and elegant awnings in Sydney, which can be customised to be used across hospitality, residential and commercial applications. 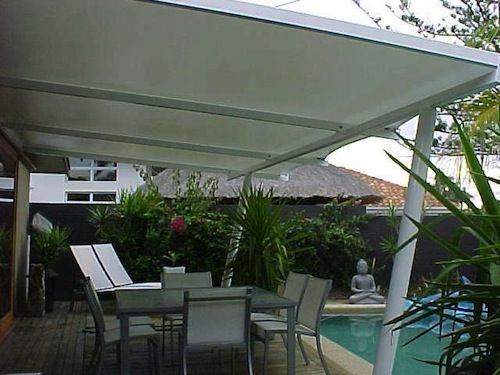 Global Shade is a reputed and established manufacturer, supplier and installer of awnings in Sydney, and across Australia. A leader in the industry, we have been in the business of shade protection for over 25 years now and our affordable and customisable products are consistently touted as the best in the country, which meet both large and small lifestyle requirements. If you’re looking for quality awnings in Sydney, you need to ensure that you deal with a reputable supplier, one that offers good quality products, backs up merchandise with service guarantees and warranties and can customise awnings to suit your specific needs. Here, at Global Shade, we offer top grade awnings, which are customisable, functional, cost effective and stylish. Our products are backed by guarantees and we offer service Australia wide. Give us a call at 1800 724 407 to discuss your awning requirements and we’ll be happy to assist you in every way that we can!